Why Does the Left So Often Disappoint? Political commentators have long been puzzled by the fact that, right across the globe and for several decades, the political left has been in retreat and – more than that – has apparently been unable to mount any significant challenge to the growing neo-liberal hegemony which has dominated western democracies since the 1980s. Many attempts have been made to find an explanation for this phenomenon, which has been marked not only by the difficulty that politicians of the left have met in getting themselves elected, but also by their apparent failure – when they are elected – to take the opportunity to put alternative policies in place. Even on those relatively rare occasions when the left secures victory, it seems that it is delivered only when the voters tire of an incumbent right-wing government and, even then, only when the left assures the voters that it will behave in a way that is little different from what its right-wing rivals would have done. The consequence is that, when the left finally is able to form a government, it seems to feel compelled to provide as good a surrogate for a right-wing administration as it can muster. The stance usually adopted by left governments is that they accept that they must operate within the framework of policy and principle that they inherit and that no challenge to existing power structures is either possible or desirable. It is believed that any attempt to make such a challenge would be a recipe for disaster and a guarantee of electoral rejection. This reluctant acceptance of the orthodox is the classic attitude of the unconfident outsider – an indicator of how much the left accepts the right’s narrative that the right are where they naturally and properly should be – at the centre – and that the left, by contrast, are – or at least run the risk of being seen as – literally eccentric. The consequence is that the left limit their ambitions to administering essentially the same set of policies, but with – it is hoped – a few tweaks that will show the voters that a left government will be more competent and compassionate. Greater competence and compassion are of course worth having, but the voters quickly recognise that nothing much changes and are easily persuaded that it makes more sense to entrust those essentially unchanged policies to the right-wing parties that positively believe in, and proselytise for, them. Left politicians, in other words, are – or at least feel themselves to be – ill-equipped to argue for, and to deliver, a serious alternative to the neo-liberal orthodoxy or a serious challenge to existing power structures. The most they feel able to offer, if we are lucky and provided they do not positively endorse their right-wing opponents’ support for the “free market” (as the Blair government in the UK did), is some minor mitigation of the free market’s excesses. One of the central issues – in fact, the central issue – in democratic politics is, who should run the economy and in whose interests? Economic policy therefore becomes the most important political battleground, where the expected differences in approach are likely to be at their most acute; it is therefore disappointing that it is precisely here that left politicians are most ready to throw in the towel. It is not too much to say that it is precisely on matters of economic policy that, time and again, and in country after country, elections are lost – lost by a left that has no confidence in its ability to resist the assaults of the right. The left constantly finds itself on the back foot, unable to answer convincingly questions about how it can responsibly manage the government’s finances or struggling to explain how they intend to finance their spending plans or as to how they can avoid raising taxes if they are to fulfil their promises. The right have available to them, in other words, a fail-safe strategy for wrong-footing their opponents. Not all right-wing leaders are quite as direct as New Zealand’s former Prime Minister, John Key, who won an election when he shouted over and over again in the main television debate of the campaign – and in his best barrow-boy fashion – “show me the money”. But the strategy is always the same, whether or not delivered with more or less decorum. The basis of the strategy is a piece of sleight-of-hand that politicians on the left seem incapable of recognising, let alone exposing or countering. Right-wing politicians – and Mrs Thatcher was an arch-exponent – always proceed on the basis, both explicit and implicit, that running a country’s or a government’s finances is just the same as running a household budget. They know that most people will instinctively accept that this is so – and the rest is then easy. As soon as the proposition is accepted, or at least becomes common ground, it is game over. The questions then come thick and fast – “how will you pay for it?’ – “where is the money to come from?” – “won’t you have to raise taxes to do all the things you say you will do?” And so too the nostrums – “you can’t spend what you haven’t got” and “you must keep within your means” and (a Thatcher favourite) the frequent parallels drawn with the prudent housewife. The average voter will nod sagely when each of these points is made; left politicians, struggling to find answers, are left looking incompetent at best, dishonest at worst. This means that when the left does somehow overcome the odds, and wins power (perhaps by promising not to “tax and spend”), they spend most of their time trying to prove that they are just as cautious and “responsible” as the most doctrinaire of free-marketeers. Ministers of finance in left governments, from Michael Cullen in New Zealand to Gordon Brown in the UK, have almost always staked their reputations on “earning the trust” of the business community, thereby foregoing the possibility of implementing a left programme that would serve the interests of working people. Grant Robertson, Finance Minister in Labour’s incoming New Zealand government, has committed himself in exactly these terms. So, the left – not daring to say that running the country is absolutely different from managing a family budget – is always pushed on to the defensive. Yet the two are indeed quite different, and in a way that the left seems scarcely to understand, let alone try to explain, or even less, act upon. Why are they so different and where does that difference lie? Because a household, or, for that matter, a business or individual has, as we all know, a defined and limited income. They must always tailor their expenditure so as to stay within the money available to them. If they spend more than they should, they will have to borrow, and – if they cannot repay their borrowings – they will be bankrupted. A country – a sovereign country, at least – is, however, in a quite different position. The one thing it need never be short of is money. It is in the end the government of that country, usually through the agency of the central bank, that decides how much money there should be in that economy. There may be all sorts of inhibitions on what a government can do, but we should never – and nor should left ministers – accept the excuse that “there is not enough money”. Governments can always create the money that is needed – that is, indeed, one of their main responsibilities. There are of course consequences – some possibly adverse – of creating more money and it should not be done without assessing what those consequences might be. The usual constraint is thought to be that creating more money is likely to be inflationary, and will therefore lead to a devaluation of the currency – and that is especially undesirable for a country, like New Zealand or the UK, that is perennially living beyond its means and consequently has to borrow, since repaying loans in a depreciated currency is never easy. But the doomsayers’ constant warnings of this kind now need to be looked at in the light of important recent developments. The story starts, at least in its most recent form, with the now almost universal recognition that the vast majority of money in circulation is not – as most people once believed – notes and coins issued on behalf of the government by the central bank, but is actually created by the commercial banks through the credit they advance, usually on mortgage, and using bank entries rather than cash. The truth of this proposition, so long denied, is now explicitly accepted by both the Bank of England and the German central bank, and was – as long ago as 1994 – explained in a letter written by the New Zealand central bank to an enquirer, and stating in terms that 97% of the money included in the usually used definition of money known as M3 is created in this way by the commercial banks. 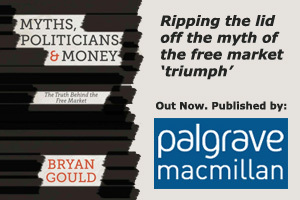 The truth of this explanation is endorsed by the world’s leading monetary economists – Lord Adair Turner, the former chair of the UK’s Financial Services Authority and Professor Richard Werner of Southampton University, to name but two – and they are joined by leading financial journalists, such as Martin Wolf of the Financial Times. The second development was the use by western governments around the world of “quantitative easing” in the aftermath of the Global Financial Crisis. “Quantitative easing” has usually (and pejoratively) been termed “printing money” but the term applied to it has now been sanitised, necessitated by the fact it was new money created at the behest of the government and applied in this instance to bailing out the banks by adding it to their balance sheets. These two developments, not surprisingly, generated a number of obvious questions – except, it seems, in the minds of our leading politicians. If banks could create – year in, year out – billions in new money for their own profit-making purposes, (making their profits by charging interest on the money they create), why could governments not also create money, but for public purposes, such as investment in new infrastructure and productive capacity? And if governments can and do indeed create new money through “quantitative easing”, why could that new money not be applied to purposes other than shoring up the banks? The conventional answer to such questions (and one apparently and unthinkingly accepted by left politicians) is that “printing money” will inevitably be inflationary – though it is never explained why it is miraculously not inflationary when the new money is created not by the government but by bank loans on mortgage, or is applied to bail out the banks. Those who support the status quo, and who want to inhibit a left government from enlarging the role of government, are of course more than happy to perpetuate this useful cautionary tale. But, in any case, the great economist, John Maynard Keynes, had long ago explained that new money could not be inflationary if it is applied to productive purposes (like investment capital from any other source) so that new output matches the increased money supply. Nor is there any reason, Keynes said, why the new money should not precede the increased output, provided that the increased output materialises in due course. These arguments are borne out by practical experience. President Roosevelt used exactly this technique, in the face of conventional opposition, to boost investment in American industry in the couple of years before the US entered the Second World War. The substantial increase in American industrial output as a result was the decisive factor in equipping the Allies to win the war. The great Japanese economist, Osamu Shimomura, (who is virtually unknown in the West), then took the same approach in advising the post-war Japanese government on how to re-build a Japanese industry devastated by defeat and nuclear bombs. The result? The post-war Japanese economic and manufacturing miracle. Today’s Japanese Prime Minister, Shinzo Abe, is a follower of Shimomura. Shimomuran policies, re-applied today, have Japan growing, after years of stagnation, at 4% per annum and with minimal inflation. And in New Zealand, the great Labour Prime Minister of the 1930s, Michael Joseph Savage, created new money with which he built thousands of state houses, thereby helping to bring an end to the Great Depression in New Zealand and providing decent houses for young families (including the one I grew up in). And ask yourself a simple question. When, during the Second World War, Britain was being assailed from sea and air by Nazi forces, was the huge effort being made in British factories to build the tanks and planes and ships and guns with which to repel the invader called off for lack of money? And if not, where did the money come from? Or was it just created because it was needed? It is the incomprehension of, or rather, the refusal to comprehend, these precedents and the views of experts and braver and better informed leaders elsewhere and at other times that is the most damaging inhibition to the ambitions of left leaders across the globe, and especially in countries like the UK and New Zealand. If they cannot bring themselves to understand how money is created, and in whose interests it is done, they will never escape the “household fallacy” and they will always be on the back foot in the battle for public support. Worse, since they appear to accept the legitimacy of the right-wing demand that they must explain “where the money is to come from”, they are always held back from doing what they seek election to do. And, even more importantly, their failure to understand the role of money means that they are never able, however radical they may wish to be, to challenge the most important power structure of all – the power to create money that lies in the hands, under current and long-standing policies, of those who know how to use that power to advance their own interests. Those interests are those of asset-holders and speculators. The status quo – one that the left seems so reluctant to challenge – is one in which monetary policy is entirely left in the hands of the banks to deliver. The commercial banks are allowed to create virtually all the new money in the economy, and the rate of growth in the money supply is regulated only by its price – and that in turn is decided by another bank through the Reserve Bank’s power to adjust the Official Cash Rate. Monetary policy currently determines therefore not only how money is created – that is, by the commercial banks – and sub-contracts (beyond the reach of democratic control) to another bank the power to decide the rate at which it is created. But it also has a major influence over the purposes to which it is put – and those purposes are not those that would promote better productivity and higher wages, but are those which offer, by underpinning and lifting asset values, untaxed capital gains to rentiers and speculators. At the same time, the productive sector constantly has the odds stacked against it by the consequences of asset inflation such as the overvaluation of the currency. The bias in such a policy is surely evident. It ensures a significant and virtually constant asset inflation (mainly in housing but also in other real property and in share values) and greatly distorts the economy by diverting the greater part of new money into the accumulation of assets and speculation rather than into new productive capacity. By requiring higher interest rates than would be necessary if new money creation were not proceeding at such a rapid rate, it imposes a further disincentive to investment and ensures, as “hot money” pours in from overseas to take advantage of high interest rates, a damaging over-valuation of the dollar that further handicaps our exporting industries. It is, it seems, this double-whammy – so damaging to our exporters but essential we are told to “earning the trust of business” – for which the left is apparently persuaded that it must abandon its ambitions for a more productive and fairer economy. Surely the “business” (both sides – employers and workers) whose interests matter most are our producers, manufacturers and exporters. Little wonder that the share of the economy accounted for by wages has fallen, whereas that accounted for by profits has risen. The successful obfuscation practised for decades as to how, by whom and for what purposes money is created has allowed monetary policy in its present form to serve as a vital bulwark for the rich and privileged against the ability of democratic politics to bring about a fairer distribution of wealth and power in our society – yet it was precisely that purpose that was sought by those who fought for our democracy in the first place. Left leaders, in other words, may be ready to fight the political and electoral battle but they have always shied away from taking on the real battle – that between money power on the one hand and democratic principles on the other. In a democratic country, there should be no question as to whose interests should be served by the state’s power to create money. A left government that created money for productive and infrastructure purposes could revolutionise the country’s prospects, by serving the whole country’s interests, rather than those of the already rich. A “lack of money” should, in other words, never be accepted as a valid excuse for inaction by a government. There may of course be other constraints – shortages or deficiencies of raw materials or skills or technology, or of markets for what is produced – and there may be social or environmental factors to be taken into account, but none of these does more than demonstrate how important it would be that money creation by government should be aligned with an agreed industrial strategy. It is the failure to understand these simple truths that has disabled the left. They have allowed themselves to be ensnared by the spider’s webs spun by their opponents, and they have lacked the will and intellectual fortitude to disentangle themselves. Far from debunking the fairy stories, they have even been half-convinced by them themselves. Democracy is intended to place the power of government in the hands of the people. That power includes the ability, and the responsibility, to create the money that is needed to achieve the people’s purposes. When the left realises the truth of this, they will have taken a major step towards making democracy a reality. As to why the left accepts to be framed by right-wing ideas, part of it is that left-wing politicians are very easy and cheap to co-opt by “corporate” interests. But most of the answer is probably that the success of the left in improving the conditions of the working class, with good wages and pensions and job security, in the 50-80s, has turned a large chunk of the working class into petty property owning middle-class rentiers; they regard their semi-detacheds and their pensions accounts as more important than their good wages and job security, which they give for granted. Mass petty-rentiers consistently vote for bigger property prices for themselves and lower wages and job security for everybody else, especially if they are older or retired divorced or widowed women voters, but not just. Therefore the often insane policies so many anglosphere (and not just) governments have devoted to pushing up property prices, as they are such huge vote-winners when 60-70% of voters are long property. and a large part of them rely mostly on property (real estate, pensions) for their income. The government can always afford the resources of the country because it already owns them. After that it’s just a question of persuading the people with the skills to utilise those resources for the betterment of the country and the government owns the means to do that too in its ability to create money. Meh. Just raise the minimum wage from what ever it is now to $16.50 per hour. People understand that pays the bills. All pretty good except for this bit. Both NZ and UK have floating rate currencies. That means the country isn’t borrowing. What is happening is foreigners are saving your currency, not spending it. And since it is denominated in your currency there is no issue ‘repaying’ it however much the currency depreciates. In fact you don’t even need to issue government bonds at all. From the point of view of a non-resident a £10 note is a zero-percent bearer bond. A Gilt is a interest-bearing bond with a term. Swapping between the two is just a bond swap – as QE has demonstrated in spades. Trade is always balanced. The problem is that the Left hasn’t realised that savings are an export product. The Norwegian wealth fund has no need of your stuff. They want your savings in exchange for oil and fish. So let’s give them that. It is cheap for us to produce. I totally agree Bryan. The voters seem to think that understanding how a country runs its finances is so so difficult it can not be understood except by those with the loudest voice who say we are doing it all wrong! When New Zealand built all the roads, the tunnels, the hydro works, the housing, the schools and universities etc etc we only had around 1.5 million people in the whole country. No body listened to those who said we can’t afford it. It was an investment in the future. I have thought this for a while but I always thought I would get really mocked if I said it out loud but here I go. If country can never run out of money and only 3% of all money in circulation is provided by Government and the rest by Commercial Banks then surely income tax is not needed to run a country. If that is the case then surely income tax is really just a way to reduce inequality. The lower the tax rate then the greater the inequality. The higher the tax rate then the greater the equality. The logic of this argument is convincing, expressed so clearly and eloquently here. The problem the left has is not so much embracing it but in finding an alternative narrative to the ‘household fallacy’. That’s incredibly tough, so counterintuitive is it that money can be generated by the government at will. Theresa May’s ‘magic money tree’ mantra probably allowed her to cling onto the keys of number Ten. The hope is that now is the time to venture an alternative. The right’s success has been to prey on the fear of economic irresponsibility hitting the pockets of ordinary people. But when large swathes of the population has so little then the fear of losing it diminishes. The pain of austerity, its failure to achieve what it was supposed to and the sense that those that caused the financial crisis have not shouldered a fair share of its burden have combined to form a climate for an alternative narrative for the first time in decades. So what is it? UK Labour’s election manifesto was an expression of its newfound confidence and conviction under Corbyn and McDonnell. Its success, albeit limited, sets out a possible path which could position such ideas as People’s QE as credible options. The next challenge is to turn it into messages that are simple to understand without playing into the hands of the scaremongers of the right. Let’s say the new centre left wing government of NZ actually decided to do this. What should the money go on? I would favour infrastructure projects (the new regional development fund would be a strong candidate) and new productive capability (which would focus on projects identified as priorities by an agreed industrial strategy. And councils. They should have access to very low (1% even) interest loans from the government. This will eliminate a council paying for a structure , say a bridge. long after the bridge has disappeared. Good point – and another of many possibilities. I would like NZ to be debating this. Eg whether we should require full reserve backing, or do what’s Japan did In the post war period and have the Treasury/Reserve bank provide ‘window guidance’ to guide both the level of credit and where itwould flow in the economy (as discussed in Richard Werner’s YouTube video Princes of the Yen). Now would be the time for such a debate as we enter the end game of one of the most damaging credit expansions in our history. One that was driven by commercial banks growing mortgage debt rather than productive activity and has left totally unaffordable house prices that are wildly out of kilter with our incomes, people homeless or living in slum like and overcrowded conditions, and young couples in despair. And left us with such high levels of household debt that any ‘correction’ will be very damaging (a la Minsky/Steve Keen). Thanks Ana – couldn’t agree more. If your argument was correct, then why not do away with all taxes (income, GST, business etc) and the government can just print any money it wants to spend. Businesses would thrive with their new found surpluses, employment would increase, beneficiaries could be paid more, everyone would be better off, utopia! Unfortunately I think I don’t think reality works this way, but nice thought …. Shaun, what you say is theoretically correct. Taxation would then be used simply to regulate certain kinds of behaviour and to redistribute resources. In real terms, however, creating money for the government simply to spend would be risky and very probably inflationary. The argument for creating money by the government is that it can be used to invest in new assets or wealth creation, as in the case of building new houses. Then it is not inflationary but simply expands the economy to evryone’s advantage – unlike the current creation of new money by the banks which has the effect of enhancing the bank’ profits and inflating the value of assets, thereby widening the gap between asset-holders and those who do not own assets. This is a very important message to get out. There is an NZ website devoted to this topic called Positive Money. Thanks Mike. I have the honour to be patron of Positive Money NZ.